The Money Bomb is the earliest comprehensive book about the national debt that I came across on my odyssey into understanding our capitalist money system. The fact that it was banned from all W H Smith windows in London after a positive review in the Evening Standard demonstrates what any critique is up against: the powers that do not want the general public to know what holds them to ransom. It is quite remarkable how banks and, above all, the Bank of England get away with fudging the issue: by talking about ‘broad’ and ‘narrow’ money rather than Credit and Cash. By not spelling out the crucial differences: whether it’s bank- or government-created and whether it’s interest-bearing or not. It is also remarkable how the author has described the problem in terms that are perfectly understandable without going into the systemic analysis that I undertake as a mathematician and computer diagnostician. He does not take economic arguments on board, but paints the big picture of a country, the creation of its money and the maintenance of its stock. “Too much money chasing too few goods” has become more and more painfully apparent to me as the organiser of the Forum for Stable Currencies at the House of Lords and Commons since 1998 which James Gibb Stuart also addressed and supported. But as a lone voice in the House of Lords, Lord Sudeley could make as little difference as Austin Mitchell MP in the House of Commons. James Gibb Stuart had generously paid for the bill of the Human Rights lawyer who advised us to “go for Parliamentary scrutiny via the Treasury Select Committee”. But making written submissions and talking to the Chairman didn’t make a difference either. Our voices don’t get heard. In fact, there is a strange kind of ‘charade’ that seems to be going on in Westminster: everything sounds right and reads well. But the realities that matter don’t change, while things are getting from bad to worse. This is only noticeable to people as they get old enough though. The fine is treble the value, i.e. every national bond issue is a punishable offence. And instead of the Government paying around 20% of its budget in interest every year, it should be paid by the Bank of England. But the battle of power between the City and Westminster is historically well entrenched. It relies on people ‘just doing their job’ in institutions. Their salaries and pensions matter. Not the public interest. It can only be hoped that the internet where everybody brings their own device, where data is becoming open and where information is shared among likeminded folk will make the difference that is so badly needed. I am glad to see the Money Bomb join the electronic world. For at its worst, it’s a record of historic significance. At its best, however, new generations of monetary reformers are going to have the kind of Aha experiences that I had 25 years ago, so that, at long last, we will see the difference that James Gibb Stuart devoted his life to. While communicating with James’ daughter, she found this 5-page article on the National Debt and the Bradburys. This is so apt, given the 100th anniversary of the Bradbury in 2014. This entry was posted in Bradburys, Money, national debt, Scotland and tagged Bank of England, Evening Standard, Forum for Stable Currencies, House of Commons of the United Kingdom, House of Lords, James Gibb Stuart, London, London School of Economics. Bookmark the permalink. 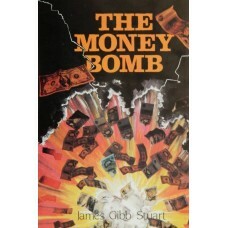 5 Responses to AUTHOR of The Money Bomb passes away – leaving an electronic heritage including the Bradburys!